For this week's Intuitive Tuesday, I selected the Eight of Cups, which is a card of walking away from something, moving on or having a change of heart. For more information on the Eight of Cups, click here. I'm not surprised by this week's Intuitive Tuesday card, the Eight of Cups. It's been coming up in my own readings for the past two weeks. My question now is what am I outgrowing or needing to move away from? I feel as though I've invited and nurtured people and situations that are nourishing to me, and weeded out the things that no longer serve me. Just the other night I felt Eight of Cups energy after I did a reading for a couple who have some significant changes happening in their lives. The cards were RIGHT ON...so much so that the man said, "It's kinda freaking me out!" My gifts are not there to "freak people out" (although sometimes that happens). My Eight of Cups insights have to do with the way I’ve read cards in the past. I now have the opportunity to leave behind the "old" way of doing a reading, and add in other aspects of my gifts to enrich my readings. For example, I could connect with the client by doing an Aura Healing as we begin our session. This will allow me to connect with their energies and open their chakras. As I finish their tarot reading, I could possibly use the “outcome card” from the tarot spread or select another card for insights on what questions they need to ponder. If there are limiting beliefs, I might have the opportunity to use PSYCH-K to help them balance these beliefs and move forward. All of these insights and ideas came in a flash of insight after pondering and writing in my journal about the Eight of Cups energy present for me. Tarot cards are so very powerful and I am constantly exploring their many healing gifts. It continues to be a fascinating journey. 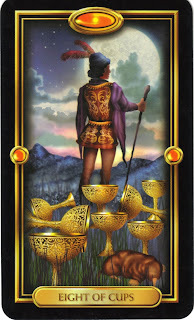 So, if you haven’t taken the time to ponder your own Eight of Cups energy, I encourage you to do so now. For a list of potential questions to ponder, click here. You may be surprised what you discover!!! The past week or so, I've been having a change of heart about the direction of my career. It's unexpected - I just started in this field and have loved it so far. It leaves me a little unsure of my future, but I can't shake the feeling that I'm not going to be doing this exact job for long. I think of it like a map: when I feel on track, it's like I'm on one of the big, solid interstates. When I'm feeling not on track, I feel like I'm one of those itty bitty thin county-road lines. I'm on one of those county-roads right now, and I'm waiting for this direction to lead me back to an interstate. For me, again, it's all about control, or about giving it up, rather. There are a number of power struggles happening at work, and I'm counting myself lucky to be going on leave soon. Honestly, it just doesn't mean that much to me, anyway. Someday I'll have to figure out what really does mean something to me, but for now, it feels better to coast. The upcoming events in my personal life are far more important. It's great that you have brought so many knowing and healing modalities into your toolbox. Love the analogy to laundry! I keep having to be reminded that spiritually, there is no there there.